Fitbit just revealed its first ever smartwatch – it's called the Fitbit Ionic and we've had the chance to play around with it – but it is also providing new fitness based devices called the Flyer and the Aria 2. The fitness focused headphones are sweatproof so you won’t ruin the internals when your brow starts dripping. but according to Fitbit they should also offer "premium sound quality" too. 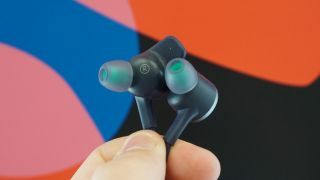 There’s a three button controller on the wire and you’ll be able to adjust the cable for your comfort, plus there's the standard variety of ear tips, wings and fins in the box that we've come to expect from in-ear headphones. Fitbit also included two sound profiles – one is called signature sound and then there's a Power Boost Mode that ups the bass to help motivate you in the hardest parts of your workout. Fitbit is also upgrading its smart scale range too with a new product called the Aria 2. It's a new version of Fitbit’s scales that launched back in 2010, but the new version will now have a more streamlined design and a brighter display. The Fitbit Aria 2 will cost £119.99/AU$199.95 (about $155), while the Fitbit Flyer will cost the same in Australia (AU$199.95) and £109.99 in the UK (about $140). We’re live at IFA 2017 later this week and will be getting hands on with everything Fitbit has announced as soon as possible.